76/100 Carols for cellos – with flats! I’m teaching several groups of young Grade 2 cellists at the moment, covering for a colleague. All the groups are wrestling with the intricacies of B flat and E flat major scales – the novelty of “first finger back” on D and A string to nail those elusive flat notes, and then the stretch for finger 2 and relax into “normal” first position. We’ve spent some time on these scales and they are beginning to sound more convincing. Jingle Bells is probably the easiest, although there is that tough stretch in the last few notes from half-position E flat on the D sting to fourth-finger C on the G string. Little Donkey is full of those stretches, this time all on the D string. The desire to be able to play “Away in a Manger” is enough for one pupil to make a determined effort to tackle a whole series of stretches between “first finger back” and normal second finger in the second phrase. 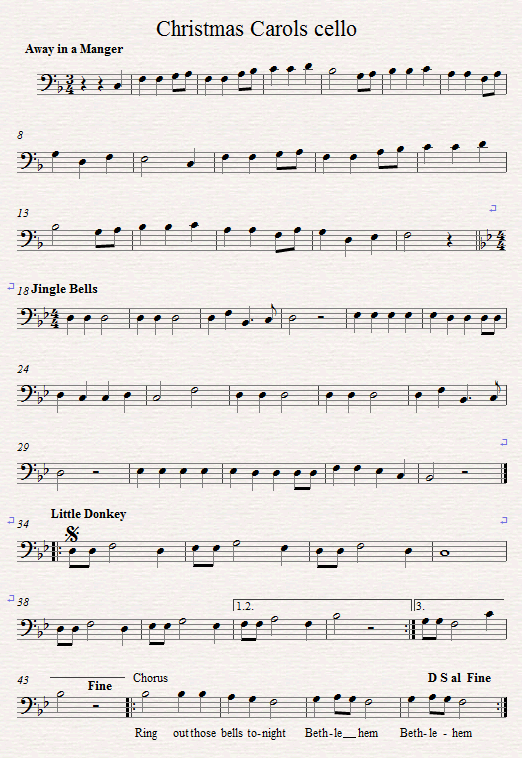 This entry was posted in Cello Teaching, Practising and tagged Christmas Carols. Bookmark the permalink.